What caught my eye was the 2,500 mAh capacity in a very small sized battery. If you have read my previous reviews on such batteries the goal is to be ready in case a Super-storm Sandy hits town and leaves you five or so days with no power. And, of course, even in the course of normal life you never want to be caught in a low-battery situation…oh, THE HORROR!!! The rechargeable internal Dense Lithium battery can power phones at up to 1% per minute and to nearly 100%. 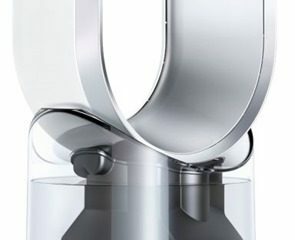 Once you plug it into the phone, it automatically starts charging so there’s no power switch to break. 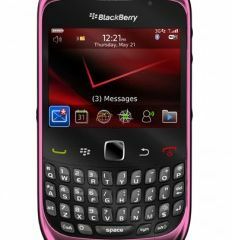 While the campaign was active one of their perks was to also donate money to the National Breast Cancer Foundation. I chose that perk because my aunt had breast cancer 15 years ago and recently died last year from natural causes at the age of 91. So I wanted to donate in her memory. 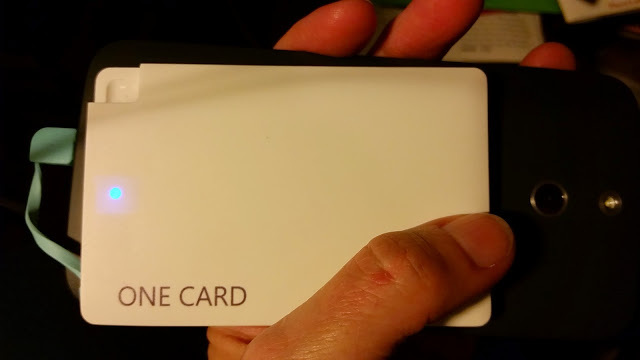 As to the ONE CARD I found the size and white color – which also is available in black – to be attractive and convenient. Here is a list of what is included in the package I received. 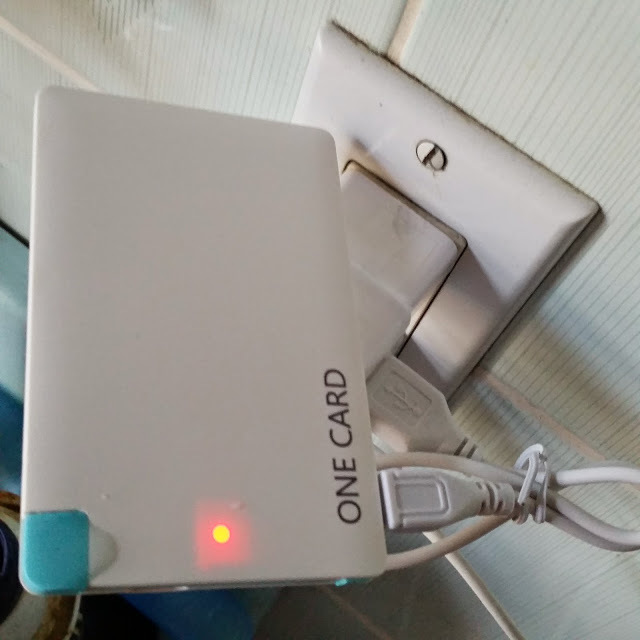 The ONE CARD, Adapters for use with Apple devices, A USB cable for charging the ONE CARD via computer or AC outlet. And a small manual. 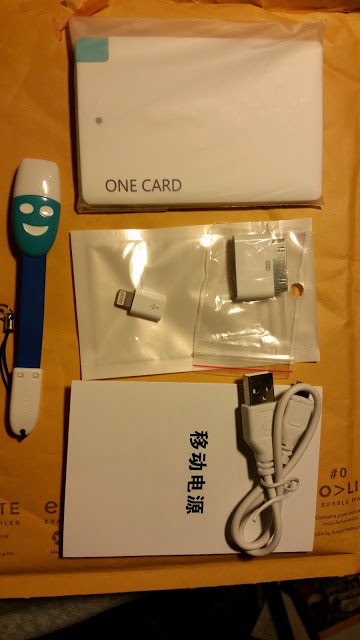 With this perk I also received a ONE STIK SD card reader which also doubles as a USB charging cable. ONE CARD is charging with it’s included cable plugged in one of my AC plugs. When it’s fully charged the red light goes out. It generally takes a few hours. Here’s the ONE CARD plugged in and charging a phone. The blue light stays on while power is going into the device…as soon as the battery is out of juice the blue light flashes for a moment then goes out. 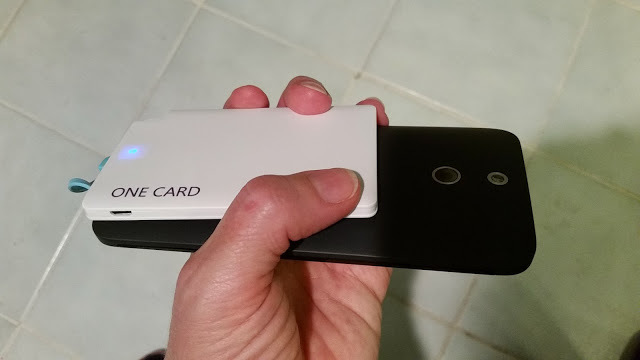 This a view to show how thin the ONE CARD is and how easy it is to hold it while holding a phone – you can make calls and easily use your phone while it’s charging. I don’t have any Apple devices but my brother does so I visited him and had him plug in the ONE CARD using the adapters that came with the battery. With a bit of effort my brother was able to get the adapter to plug into his iPhone S4. Charging was successful! 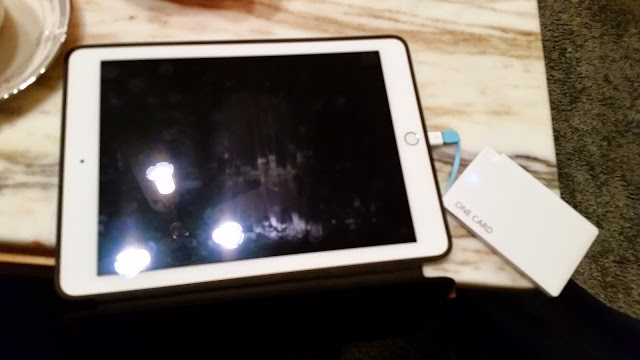 I know it’s not obvious in this photo but the ONE CARD IS charging my brother’s brand new iPad Air. This uses the smaller Apple adapter. My brother’s opinion is that the connectors are a little tricky to work but they obviously do get the job done. There’s a molded slot in the ONE CARD where you can fit the Iphone 5/S5 lightening adapter for convenient traveling. 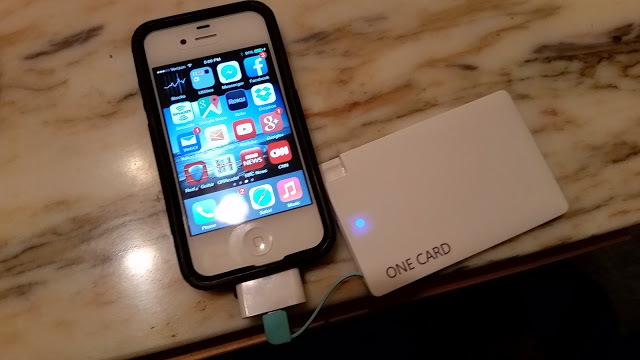 Just plug the lightening adapter in to the ONE CARD Android plug and then plug into your phone. I tried a few tests to see how much the ONE CARD could hold and how much is could charge. 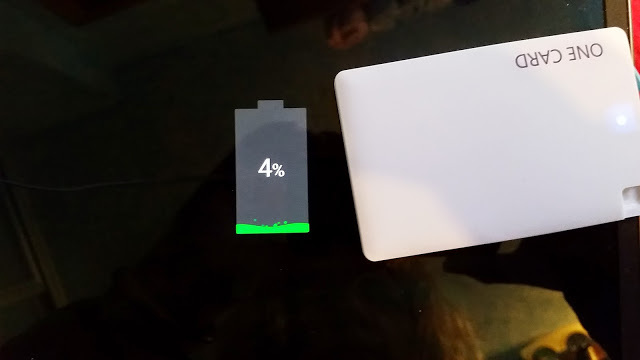 Here I am charging a tablet when it started out at 4% charged. The ONE CARD would get it up about 20% more charged before it emptied out. 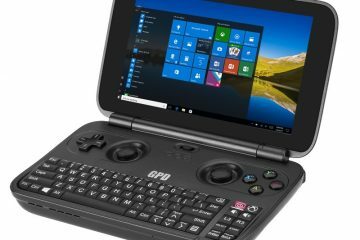 After charging the ONE CARD it would charge up the tablet another 20%. It was fairly consistent…always charging the tablet 20% more. I made several tests with phones. SO one phone was at 63% and the One Card got it up 100% — taking a couple of hours to do so. Then I plugged it into another phone which was at 70% full – and the ONE CARD got it up to 93% (couple of hours) before the One Card blinked out of juice. The phone started out at 62% full and got to 100% in one hour. I then plugged the ONE CARD into another device which was at 62% powered up and it was charged to 83% in one hour and 36 minutes. The phone started out at a sad 7% and was brought up to 59% in five hours before the ONE CARD gave up the ghost. Once the ONC CARD was empty I plugged in into the AC and timed how long before it was fully changed. It took sightly over 6 hours. Now, for these tests I didn’t do anything with the phones, although they were turned on and getting notifications as usual. I have used a phone with the ONE CARD charging it while I was making a call and it works invisibly. I even used it to charge my old Virgin Mobile phone which is nice because that sucker runs out of battery life easily. 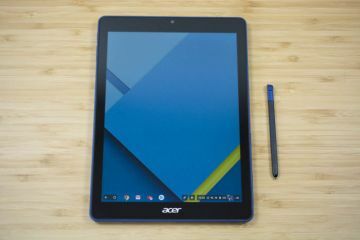 And as it’s nice and thin it’s really great for carrying around. 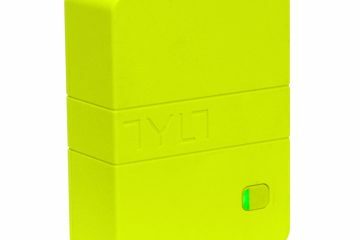 It just slips into a pocket or bag without making a bulky disaster. SO, is the ONE CARD worth it? It certainly seems to charge well enough. And more than just a few percentages. I can be assured that if I have to make a series of phone calls or do a search I won’t be left UN-powered in an emergency. Now I just have to find the perfect solar panel recharger…..
You can check out the web site for more info and devices.